You love it. You hate it. You fear it. But ignore Consumer Reports magazine at your peril. Consumers Union, a nonprofit group formed during the Depression to warn consumers about shoddy cosmetics, foods and household goods, has scrutinized new cars since 1936. It launched its annual auto review magazine in 1953. Since then its test ratings and surveys have been the Bible of unbiased recommendations for auto shoppers. 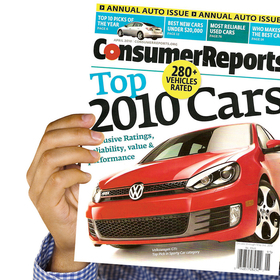 There are 6.9 million paid subscribers to the magazine and its Web site, ConsumerReports.org. When Consumer Reports likes a vehicle -- like the Hyundai Sonata -- dealer sales have been known to rise. But when it dislikes something -- like the control buttons on the Ford Edge -- things have been known to go poorly. Automakers react to negative reviews, whether it is to re-do software for a Lexus stability control system or to appoint a new quality-control executive at Volkswagen Group of America. Currently, Ford Motor Co. is scrambling to address the magazine's beef with the control buttons. Consumer Report's displeasure with what it called "overly complicated" controls resulted in the Edge losing the coveted "recommended buy" status. But it is one of the oddities of the U.S. auto industry that, although automakers feel the effects of Consumers Reports' reviews, the magazine's power remains hard to measure. Consumer Reports itself doesn't track its influence, says Rik Paul, a 30-year veteran of automotive journalism and editor of the organization's automotive publications. "Our mission is really just to tell people what's the best car for them, based on our testing and surveys," Paul says. "What happens after that -- that's not something we consider." In the late 1970s, Consumer Reports blasted the Plymouth Horizon's steering. Chrysler waffled, then made a change. Education: Nearly half have completed college. Of those, 21% have completed graduate school. One big reason is the proud, old-fashioned, unyielding policy of Consumers Union toward marketing and publicity: CU vigorously prevents anyone -- automaker or kitchen blender maker -- from mentioning Consumer Reports anywhere in its advertising. In the interest of remaining objective and not beholden to anyone, it does not sell its data. It does not provide consulting services. Retailers are prevented from using a Consumer Reports thumbs-up to sell a car. "That comes up more often than you'd think," Paul says, referring to auto dealers mentioning the verboten CR name in TV or radio ads, or quickly printing up fliers to ballyhoo a favorable rating. "Our legal department will very quickly send them a cease-and-desist letter to put a stop to it." Industry figures differ in assessing Consumer Reports' clout. "People like to tell you they're influenced by research, but they often go ahead and buy whatever they want for emotional reasons," scoffs Jim Hall, senior analyst with the Detroit consulting firm 2953 Analytics. "There's more to car sales than careful reasoning." Jack Fitzgerald, owner of the multibrand Fitzgerald Auto Mall in Kensington, Md., takes the opposite stance. Fitzgerald has campaigned for years to get automakers -- the Detroit 3 in particular, and General Motors most of all -- to focus on whatever Consumers Union deems important. "There has never been a successful auto company in the United States without having positive ratings from Consumer Reports," Fitzgerald declares, pausing in silence to defy the listener to challenge him. "Auto companies that have disappeared from the U.S. market over the years have suffered from poor Consumer Reports ratings. The Ford incident is merely the latest time Consumer Reports has flexed its muscles. 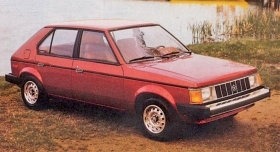 Back in 1978, financially troubled Chrysler launched the Plymouth Horizon/Dodge Omni as comeback cars, just as it tried to convince the federal government to save the company from bankruptcy. Unconcerned with Chrysler's plight, Consumer Reports warned that the cars had a terrible steering problem. In a dash of bad public relations, Chrysler countered that "some do, some don't." Then it implemented a steering change. The review organization has also warned consumers away from what it deemed rollover-prone Ford Bronco IIs, Suzuki Sidekicks, Isuzu Troopers and Acura SLXs. It favored vehicles that offered electronic stability control systems before the technology was common. It is now trying to make consumers more aware of the danger of onboard driver distraction. Late last year, it began fuming about Ford Motor Co.'s onboard electronics control system, called MyFord Touch and MyLincoln Touch. Consumer Reports griped that the common buttons that operate the heating, air conditioning, radio stations and navigation on the Ford Edge and Lincoln MKX were too small, too sensitive and too confusing. Worst of all, it said, fooling with them created a dangerous driving distraction. Because the models had scored just modestly well in Consumer Reports' testing, the MyFord complaint knocked them out of the running for a coveted recommendation. This month Ford responded, saying its dealers will give consumers free tutorials on MyFord Touch operations. Ford dealers will make technicians available specifically to answer questions on the system. Other automakers also have reacted quickly to Consumer Reports' complaints. Last April, Toyota Motor Sales U.S.A. halted sales of it Lexus GX 460 SUV after the review organization put it on its "do not buy" list. Consumer Reports' testing staff said that the vehicle had a tendency to swing wide during sharp turns, and that its electronic stability control failed to correct it soon enough, creating a scenario that could cause a rollover. Toyota quickly implemented software modifications in response. The Lexus is now a recommended buy. Volkswagen Group of America is also trying to pay more attention to what Consumer Reports says. In fact, Volkswagen's U.S. engineers have begun asking the organization for more input into its vehicle design and requesting testing details from the Consumer Reports' testing, says Marc Trahan, vice president of group quality for Volkswagen of America. It is a new effort by VW to step up North American product quality, and hopefully do better in Consumer Reports' rankings. Trahan was named to his newly created quality position last September in Auburn Hills, Mich. He says VW now wants to expand the quality program to take on "design quality." But how Consumer Reports can play a role in that is delicate business, he admits. "They have fantastic resources," Trahan says. "Who else collects reliability data involving millions of consumers, going back 10 years? I don't know of anyone. "But we obviously don't want to do anything to compromise their objectivity and independence." He says his group has asked Consumer Reports for data, and Consumer Reports has given it to the group -- at no charge. Based on Consumer Reports data, Volkswagen has redesigned the system that controls the heated seats on all of its models. "Using their data, we were able to persuade our colleagues in Germany that we really needed a different way of operating this." Ignore Consumer Reports at your own peril, warns auto mall owner Fitzgerald. For 50 years, Fitzgerald has been a prophet in the wilderness. In 2000, Fitzgerald spent $100,000 to have a research firm survey consumers about the extent to which they relied on Consumer Reports. When the results confirmed the magazine's influence, he tried to interest GM. He presented the survey to Marriott International CEO J.W. Marriott Jr., who lived not far away in Bethesda. The hotelier was on GM's board of directors at the time, head of its compensation committee; through Marriott, Fitzgerald's material found its way into GM's boardroom. Fitzgerald soon found himself invited to tour GM locations, where he made presentations to GM executives, engineers and manufacturing managers about the correlation between sales and Consumer Reports ratings. In the end, the dealer recounts, "I never heard anything else about it." "It was pretty obvious then, and it still is. People often come in knowing what Consumer Reports says."